It's two straight weeks of top flight dramas with A-list actors, ecstatic reviews and strong Oscar potential, which should also perform strongly at the box office. One could get used to this kind of thing. In related news, you should not get used to this kind of thing. 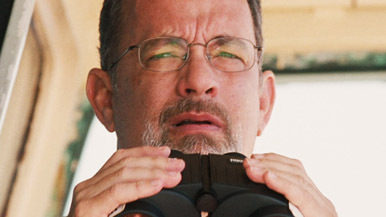 Captain Phillips stars Tom Hanks in a story about a real-life hijacking of an American freighter ship by Somali pirates in 2009, which was the first time most Americans heard the phrase “Seal Team Six”. While the successful (spoiler alert!) rescue mission was the larger takeaway from this for the general public, the actions of the captain while the hijacking was taking place are the focus of this film. The version of events as presented by director Paul Greengrass and writer Billy Ray isn't without controversy, as crew members have called them aggrandizing towards the captain. But basic accuracy set aside, we're talking about the film as presented as entertainment, and to what level it passes that test. Greengrass has proven himself to be a superior director of action thrillers after taking over the Bourne series and providing it with its two best chapters, and has also tackled real-world drama, with the magnificent United 93, a more-or-less as it happened recreation of that fateful flight on September 11th. It's one of the greatest films I never want to see again. In addition to those films, you can also make some comparisons to Black Hawk Down and Cast Away by location and actor. That last point is important since it's almost entirely the Tom Hanks show – the Somali actors are all first timers, and hardly anyone in the rest of the cast rises to “that guy” status. All of these factors point to an opening weekend somewhere in the mid-20s. Hanks as a lead has been all over the place recently, in large part to the kind of roles he's chosen. Your Toy Storys and your Robert Langdon films are partly driven by him, but mostly by the material. The showing of Larry Crowne, however, proves that just having Hanks isn't the recipe for a hit film. Although it shares very little thematically with the recent Prisoners, I think it's going for a lot of the same audience – adult film goers looking for intelligent entertainment. Reviews are as good as they could really be, and this should help it open up to around $27 million.